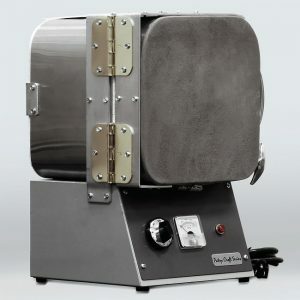 Enameling Kiln with Window – This Kiln is great for home use or in your art studio. 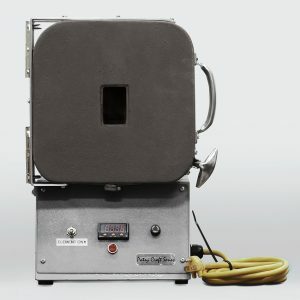 It fires to 1500 degrees in 5 minutes with an analog pyrometer and a quartz window for viewing. We have the window in a vertical position here for the best view of your jewel, but at Patsy Croft Kilns we offer flexibility – it also can be horizontal at your request. Again, this small kiln is fast to temperature. A window in your enameling/jewelry kiln! My kilns are handcrafted and designed for use in all mediums. 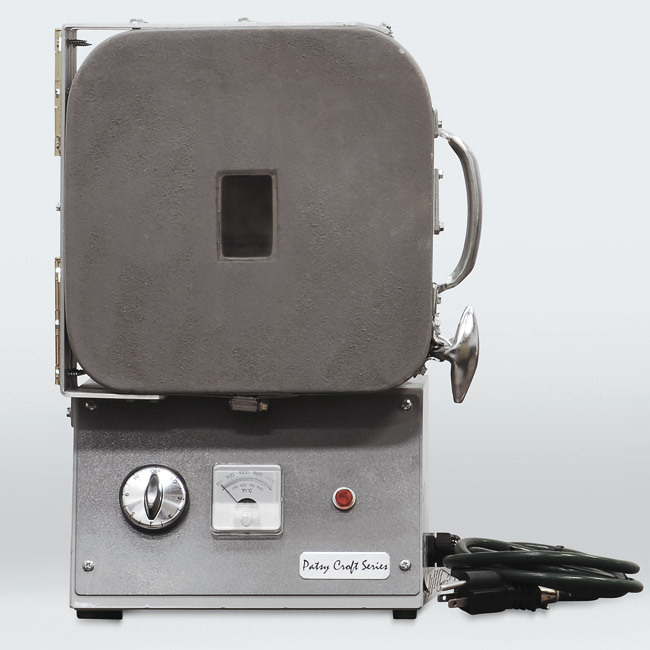 This small and portable kiln will help you create breathtaking jewelry or small keepsakes. Wow, this added addition of a window is awesome! When we add a window to our kilns they are placed at a level best for you to view your jewel as it is firing. 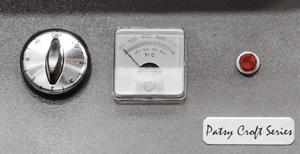 Choose a countertop that puts your enameling kiln window, about 7 inches below eye level. This allows you to see the top surface of the jewel without the glare on the surface of your creation. After you have the feet and shelf in place add a trivet on a firing rack and place it inside the kiln. This will give you a perfect view of your work in progress. Remember when you dream of your main piece of equipment to create your jewels, all my kilns are hand made at the time of order. This means any customization is possible. Love it! I use a large kiln for enameling multiple pieces at one time, but it's just too big for my one of a kind cloisonne. This little gem is "just the right size" for doing smaller task including annealing and individual pieces. It really does heat up to 1500 degrees in about 5 minutes! Stays super hot inside, even when opening door, yet you don't feel like your going to melt your arm off when placing your "jewel" inside- a problem on the larger kilns. I had a handle put on mine so I can take it with me on my many travels. Easily works on a kitchen countertop when there's no studio available. One of the best investments I've made. Of course, I knew it would be perfect from the start with Patsy Croft designing it. Thanks for a support product! 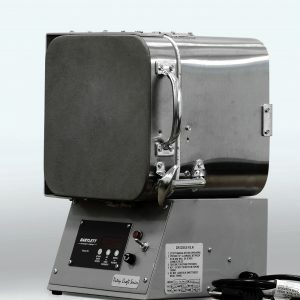 This is the perfect kiln for anyone doing jewelry size items. It gets up to temperature in about 15 minutes, saving time when I decide to squeeze some enameling into a busy day. It recovers temperature quickly when the door is open but by choosing the window option I can see exactly when the enamel has flowed properly. This is a sturdy little work horse that takes up minimal space. 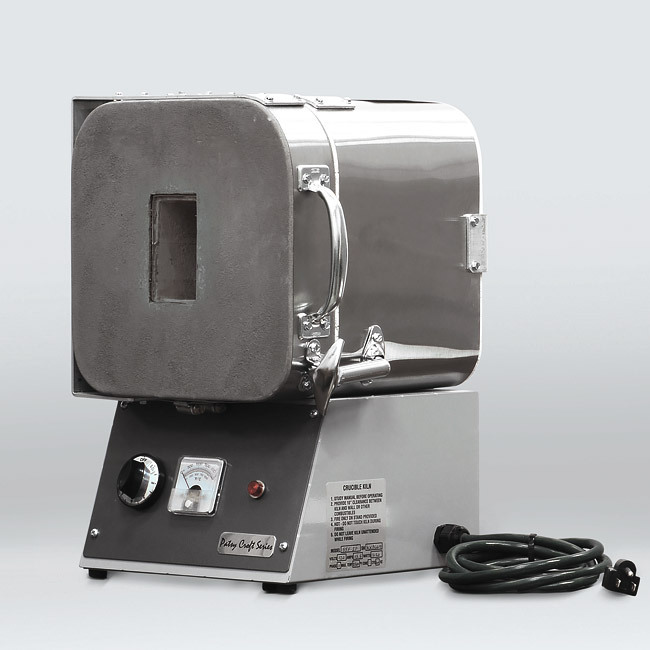 I have recommended this kiln to many other enamelists. Although I have two larger kilns that I also like, this is my go to kiln most days. So this has been a wonderful addition to my studio.